Our gorgeous Amish Turned Leg Island is pictured above with a maple butcher block top and optional reeded legs. You can count on quality and sturdiness with this 100% hardwood handcrafted kitchen island made right here in America! The two drawers at the top make for easy storage with quick access, the tools you need right at your fingertips when preparing delicious meals for family and friends. Equipt with closed storage and exposed shelving to display some of your favorite cooking books and kitchen gadgets. Decorate your kitchen with a centerpiece on your butcher block kitchen island. Make It Unique. Customize It. Select from a number of options to customize your new kitchen island. Match it to your current kitchen setting by ordering wood and finish samples or customize it with bold colors to make this kitchen island pop and be the center of attention in your kitchen. We love the clean lines that this piece boasts. Topping it off with a light-colored butcher block makes for a perfect contrast. 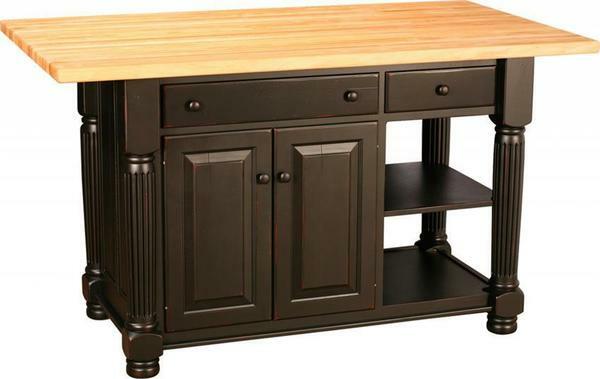 Allow our Amish Turned Leg Island to become the focal point of your kitchen. Best of all, you'll be able to enjoy this piece for many years to come thanks to expert Amish craftsmanship.